Cardinal Jozef Glemp, who headed the Roman Catholic Church in Poland for more than two decades, has died at 83. He became cardinal in 1981 and held the post during most of the papacy of John Paul II, the first Polish pope. He also saw the end of Communist rule in 1989, after years of church opposition before and in conjunction with the Solidarity trade union. He stepped down in 2004, and had been ill for some years, having been diagnosed with lung cancer. He died in hospital in Warsaw. 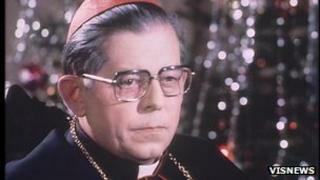 When the Communist authorities banned Solidarity and imposed martial law in December 1981, Jozef Glemp had only been cardinal for a few months, and had been made a bishop only two years earlier. He made a public appeal, saying: "I ask you, even if I have to do it with naked feet and on my knees: do not start killing each other." Some anti-government activists were critical of his stance, seeing it as too close to the government line. Cardinal Glemp said that he "wanted to calm things". "Glemp led the Church in a period which was extremely difficult for Poland," said Catholic KAI news agency's chief editor Marcin Przeciszewski. Later, in post-Communist Poland, he tried to reduce mistrust between Catholics and Jews, making public apologies for historical acts of anti-Semitism.